This month you can become an accountant debating philosophy, an accident-prone space captain, or a historical character from a famous series of books. Foodie adventurers can attempt to thwart a pizza apocalypse or investigate strange goings-on at a carnival of cheese. Those who prefer less jolly tales can try to avert a disaster by gifting ten seconds of life, or escape a deranged killer in a decrepit surgery. Alternatively, you can go cave-delving with a intrepid young adventurer. 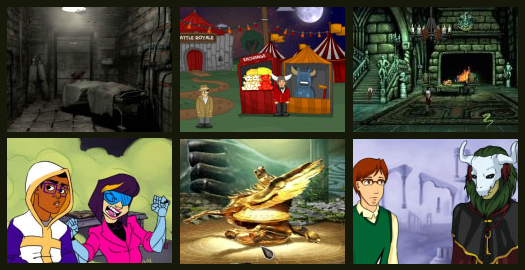 All these await you in this month’s roundup of releases from the freeware scene. Socrates Jones, accountant, never thought of himself as that good a debater. His daughter, the philosophy student, was always much better at that sort of thing. But having driven off a door-to-door salesman, he allows the success to go to his head and fails to pay attention to the road. The resulting car accident propels both him and his daughter into the Intelligible Realm, the last resting place of all philosophers. He has but one chance to return them to life. If he can find the nature of morality, then he can pass back to the mortal realm. But with so many philosophers willing to share their views on the matter, this will prove no simple task. With echoes of the Phoenix Wright series, this game from Chief Wakamakamu shows just how intelligent a game can be. The graphics are presented in a third-person style with fully expressive characters. Socrates himself appears on the left of the screen, with other characters popping in and out on the right as he converses with them. The graphics are not animated as such, but the poses of the characters change to reflect their mood at the time. The philosophers represent real historical characters, such as Euthyphro of Athens, or Immanuel Kant, and are drawn in a way to make them recognisable. The music mimics the Ace Attorney games, with simple repeated themes changing to a frenetic pace as debates heat up. There is also limited voice work. Control is handled via a panel of options at the bottom of the screen. Each philosopher that you meet will put forward their view on the nature of morality, and it is up to you to critically examine their argument for flaws. You can ask for clarification, backing or relevance for any statement, sometimes resulting in statements changing. The goal is to seek the flaw in each argument, challenging with an audible cry of “Nonsense!” instead of “Objection”. There are several chapters, each with a different philosopher, and each chapter has multiple sections as the philosophers refine their arguments based on your challenges. The game auto-saves as you finish each segment, both keeping your place and allowing replay of completed sections. Whilst the game deals in serious intellectual discussion, the tone throughout is light. Socrates Jones: Pro Philosopher can be played online at Kongregate. When you’re prone to sleepwalking, the last place you should really think about taking a nap is next to an intergalactic stargate. Captain Disaster doesn’t abide by such logical thoughts and soon finds himself transported to the eponymous dark side of the moon. Undeterred by the lack of oxygen, he sets about to fix the power to the broken stargate control so that he may yet return back home. Of course, things are never easy and the road to restoring power is mixed with a series of dangers and oddities. The Captain soon encounters everything from crazy shining diamonds to giant monkey heads to ripened roddenberries through to the remnants of the malevolent Bjork race in a blatant homage to '70s rock, sci-fi TV and classic adventure games. The Dark Side of the Moon is Team Disaster’s first foray into a larger planned series, and at times the low-budget production values do show through this initial effort. Though the game runs fine, the pixel art style is blocky and the animations can become a little warped, particularly when moving. The point-and-click controls are simple but effective, requiring players to traverse the over-world in order to find scattered items that have somehow found their way onto the moon’s surface. Left-click is used to move your character and interact with objects, whilst right-click can be used to provide a detailed description of any item. There’s no voice acting, but the background music bears a clear infatuation with the wailing, psychedelic sounds of Pink Floyd and provides some pretty catchy licks. Captain Disaster holds little pretence about the kind of game it aims to be, mirroring its gameplay closely to classic Sierra and LucasArts adventures. This means that you'll follow the simple formula of picking up items, combining them and using them with other things whenever appropriate. It also means that the game provides a healthy dose of light-hearted humour throughout. Puzzle solutions are rarely arbitrary and solving them remains fair, despite some pixel hunting later on. Overall, this proves to be a rather basic game, but the dialogue and constant quips about its inspirations ensure a certain charm. Captain Disaster in "The Dark Side of the Moon" can be downloaded from Game Jolt. When you escaped from the Burner’s underground lair, you thought you were safe. But instead of emerging out on the streets you find yourself in a strange and bloody dental surgery. Ambushed, you wake up strapped to a chair and facing horrible torture at the hands of a mad dentist. Then a sudden blackout gives you an unexpected opportunity to escape. But just who undid the straps in the darkness? Was it the mysterious Observer, and if so, do they really have your best interests at heart? Psionic Games's horror series continues, with a fresh psychopath ready to do away with you. The graphics use the same first-person slideshow format of the previous episode, though the setting this time is a macabre surgery and mental hospital rather than an abandoned basement. There is a similar mix of wide-shot rooms, with varying levels of close-ups as you move in to examine items such as a sheet-covered cadaver. Animation is limited, predominantly being used for background effects such as flickering lights, though there are a handful of close animations to take you by surprise. After the opening horror theme tune, sound is largely restricted to ambient noise, such as buzzing electrics or an echoing water drip. There is also some spoken dialogue from your deranged tormentor. This is once more not a game for the young or faint-hearted, with the setting alone being fairly horrific. Using standard mouse controls, you will initially only be able to access the room with the chair. Inventory use and unlocking a nearby computer will get you further into the complex. There is a repeated puzzle required to unlock the exit lift that will need moderately quick reactions, as will a single fishing puzzle. The game also includes some optional collectibles in the form of newspaper clippings. The proximity of this episode's killer to the antagonist in the previous game is given some explanation, though the adventure ends with your current conflict resolved but much left unexplained. Killer Escape 2: The Surgery can be played online at Kongregate. Do serpents dream of electric sheep? This is a question Memories of a Snake never quite addresses. What it does instead is to offer a story inspired by the world of Harry Potter. It tells the story of Salazar Slytherin, the son of a prestigious family, heir to the Slytherin of Norfolk and, as Harry Potter fanatics may know, one of the four original founders of Hogwarts School of Witchcraft and Wizardry. Taken as a prequel of sorts to the novels, Memoires d’un Snake (to use its original French title) explores the history of the Harry Potter universe, providing a host of references to J.K. Rowling’s novels within a tale all of its own making. According to the game's creator, Marion, much of the artwork has been borrowed from other games. The backgrounds have been taken from old Sierra titles such as King’s Quest and Quest for Glory, whilst the characters have been made using Ultima Online character viewer. The result is detailed pixel art which looks like a throwback to the '90s but does well to construct a medieval atmosphere. The environments can be interacted with, such as an early moment when you find yourself trying to pluck out a ring from beneath the murky depths of the swamp. The music ranges from booming orchestras to the more joyful sound of a lute. Overall, the game plays largely like a Sierra title set in J.K. Rowling’s literary universe. It has a simple point-and-click interface, with left-click used to interact and move the character around each screen whilst right-click offers descriptions of items or people. There is an inventory at the bottom of the screen which is used to store items collected throughout the adventure. Text pops up when a character speaks that is written in a fancy old-style font, and there is a choice of a dialogue options to pick from. The characters are appropriately fitting for the Harry Potter universe, including a house-elf called Venom and Slyther, a frightening-looking snake whose job seems to be guarding the front of the Slytherin household. Memories of a Snake can be downloaded from Adventure Game Studio. Thanks for featuring Captain Disaster - it seems like you really got what we were trying to do, which was simply to create an enjoyable little game full of references to classic adventure games and sci-fi (and Pink Floyd of course! ), along with a healthy dose of puzzle-solving.